Let go of toxic patterns to improve your experience, love the life you have, and create the life you want. 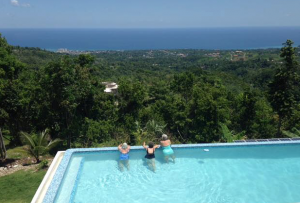 Relax with yoga, somatic detox, and group coaching in a remote, natural setting. A table of pure gold lies at the bottom of certain rivers, usually at the river’s source. It rises briefly to the surface from time to time, particularly at midday, affording a glimpse of its golden beauty. The sight of the table mesmerises whoever sees it, and they become obsessed with the desire to obtain it. Efforts to procure the table end with disaster. The river eventually claims the lives of those who try to remove the table from the water. When we stop grasping and let go of our preoccupations, abundance flows from our source. When we try to control divine essence and get attached to certain outcomes or habits, we lose our true lives. Paradoxically, when we accept and love our life exactly as it is, we find opportunities to begin manifesting new dreams. This retreat will support you to let go: of the need for control, of lingering resentment, of toxic habits, of self-abnegating patterns that have become oddly comfortable. Through various optional levels of detox, from delicious meals prepared with local organic vegetables, to the daily practice of yoga, to immersion in a wild and beautiful mountain venue, to sessions focused on supporting one another through group dynamics and psychodramatic exercises, these few days are intended to permanently affect the rest of your life. This retreat is open to new attendees and to all genders. Space is limited to 12.